I love Lawn Fawn stamps! 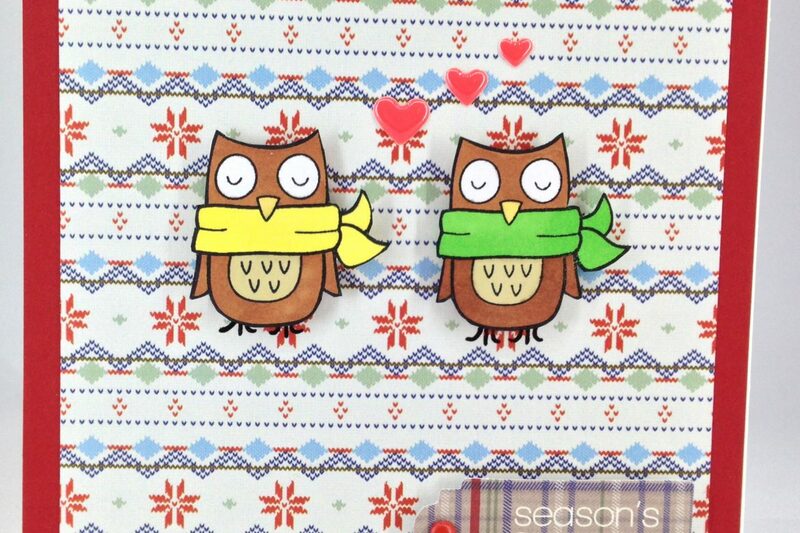 I bought a cute little owl stamp set from them recently and knew they’d make some great Christmas cards for couples I knew. I’m getting the hang of cutting out stamped images now! The paper is from Create Christmas by Papermania and the stamp is from my stash. This was me trying out the idea and I liked it but didn’t like the stamp – it got lost on the background but I didn’t just want to stamp it onto white card and put it on top. Apologies for the wonky photo on this! I much prefer this one. The enamel hearts from My Mind’s Eye are just so cute! I’m still not 100% sold on the sentiment but it definitely pops more than on the blue card. The owl stamp came with some hearts and a sentiment: ‘Owl I want for Christmas is you.’ I haven’t used that yet but I still have Ed’s card to do so watch this space!